An advertising tax is not a new idea, just a bad one. Arizona, Iowa and Florida each passed broad advertising taxes. Each state later repealed the tax because it hurt their local economy and was impossible to administer. Since 1987, when the Florida services tax was repealed, broad advertising taxes have been considered in more than 40 states and rejected in each case. As corporate citizens, the advertising industry contributes to Oklahoma’s tax base through business operations, employees and shareholders. An advertising tax is economically unsound. Advertising taxes slow economic growth. Studies by the Wharton Econometrics Forecasting Associates show that a tax on advertising reduces local employment and personal income by substantial amounts. When the cost of advertising goes up, there is less advertising, which leads to less consumer demand. This slows the economy in general, reducing its usefulness to the government as a source of revenue. An advertising tax is an anti-business signal. A tax on advertising would send a very strong anti-business signal to firms that are considering locating their operations in Oklahoma. Advertising dollars that are currently spent in Oklahoma would be shifted to media outlets outside the state. An advertising tax is too complex and expensive to administer. An advertising tax would create a huge collection and administration burden for both businesses and state government. Advertising is a very complex field, involving millions of ads placed with television, radio, magazines, and newspapers. Oklahoma government and businesses would need an army of accountants and lawyers to administer the rules. 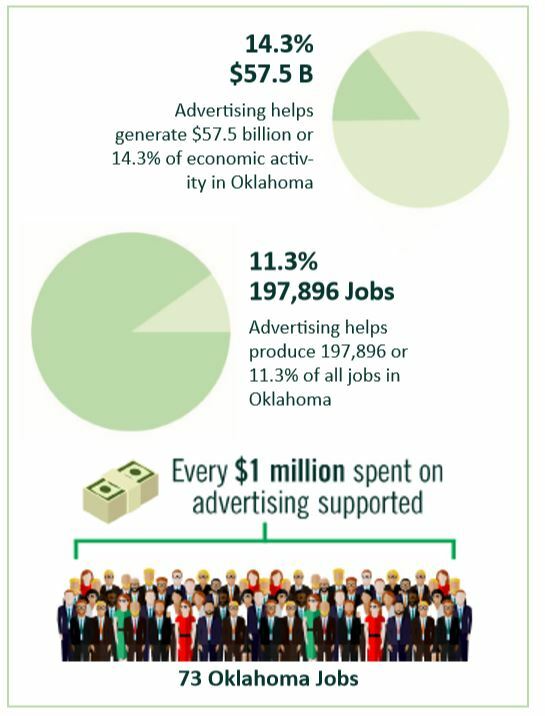 Advertising creates jobs and stimulates the Oklahoma economy. Many small companies engage in cooperative advertising, where national manufacturers and local retailers share advertising costs. For many businesses, from drug stores to supermarkets and franchise restaurants to automobile dealers, cooperative advertising is a cornerstone of their marketing efforts. An Oklahoma sales tax on advertising could seriously threaten these cooperative agreements. National firms, in an attempt to use their limited cooperative advertising budgets in the most effective manner, would likely shift these dollars away from Oklahoma to states that do not diminish their selling impact through advertising taxes. Advertising is a powerful engine that helps drive the economy of Oklahoma. Advertising expenditures account for $57.5 billion of economic output or sales in Oklahoma – that is 14.3% of the $401.7 billion in total economic output in the State. Sales of products and services that are driven by advertising help support 197,896 jobs, representing 11.3% of the 1.8 million jobs in Oklahoma. © 2017 No Ad Tax Oklahoma. Sponsored by the Oklahoma Association of Broadcasters. All Rights Reserved.